Participating in research studies about loss and bereavement? Taking surveys to gather data to help professionals support our families? Helping make changes to our laws? We would love your help improving care and increasing awareness for pregnancy loss and stillbirth. ​If so, please SUBSCRIBE below to receive emails on opportunities to to help support bereaved parents. BPoM invited community professionals and parents to join us for the film screening of Still Loved. Edgewood College Henry Predolin School of Nursing co-sponsored the event for the second year! We were excited to have over 40 attendees through out the evening. 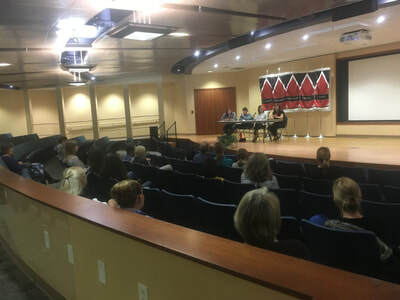 Thank you to our moderator Rebecca Markert, and panelists Jenah Ulrich, Leah McNeely, and Sue Tjugum! Ivy Anderson and Leah McNeely volunteered at the resource table at the Forever In Our Hearts Walk hosted by Mikayla's Grace. They were there to support families and direct them to local resources. Claire Matejka from Bereaved Parents of Madison and Amy Helt from SSM Health St Mary's in Madison share the HUGS bedside bereavement program. 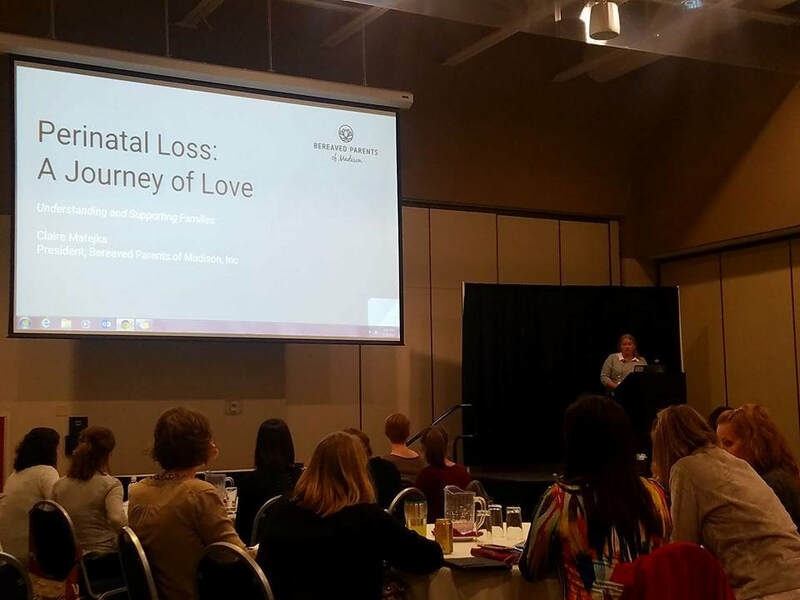 We were honored to present on the topic of Perinatal Loss at the WI WIC Association Professional Development Day. 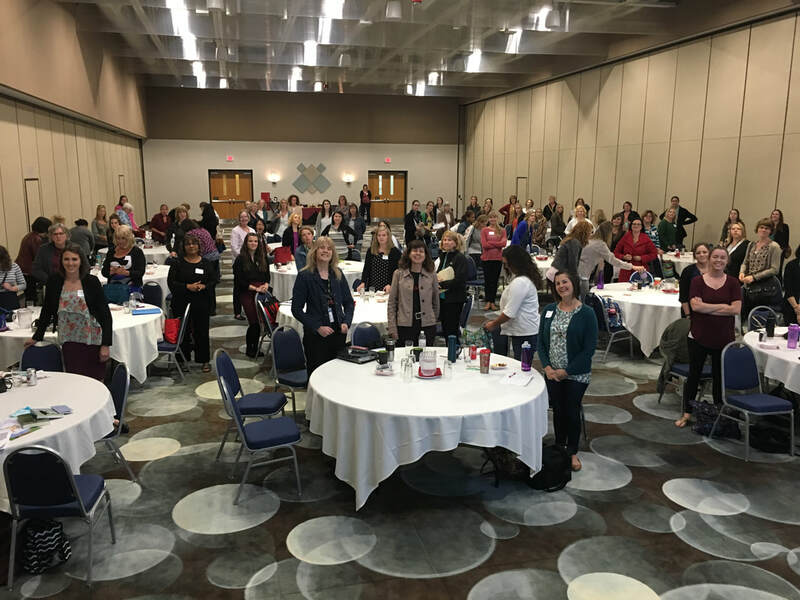 Claire Matejka shared her story with 114 WIC Directors and the feedback was amazing. They were so thankful to hear and learn from a first-hand story. It is a honor to have our HUGS program nominated for the second year in a row for a Star Award through Star Legacy Foundation. Please vote and share with your friends! 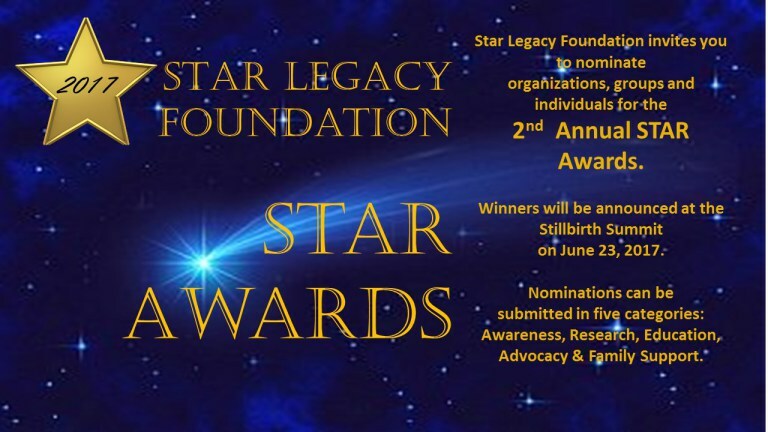 "Star Legacy Foundation will recognize individuals, groups and organizations that are making a difference regarding pregnancy & infant loss issues with its Star Awards." On May 2, 2017, volunteers and organizations from around Dane County were recognized for their contributions to the community. The HUGS volunteers were honored to be nominated. While we did not receive an award, we appreciate the recognition and opportunity to share our program with the United Way family! Photo: Claire Matejka and Emily Grorud in the Nominees Circle. Photo shared by UWDC's Facebook page May 9, 2017. 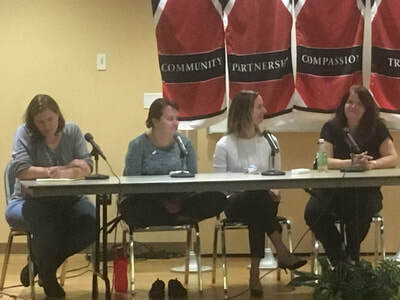 In addition to inviting the Madison community to participate in their memorial service for babies gone too soon, Amy Helt, RN shared the HUGS program and how we are a collaborative piece of the team to make sure families are cared for after discharge. 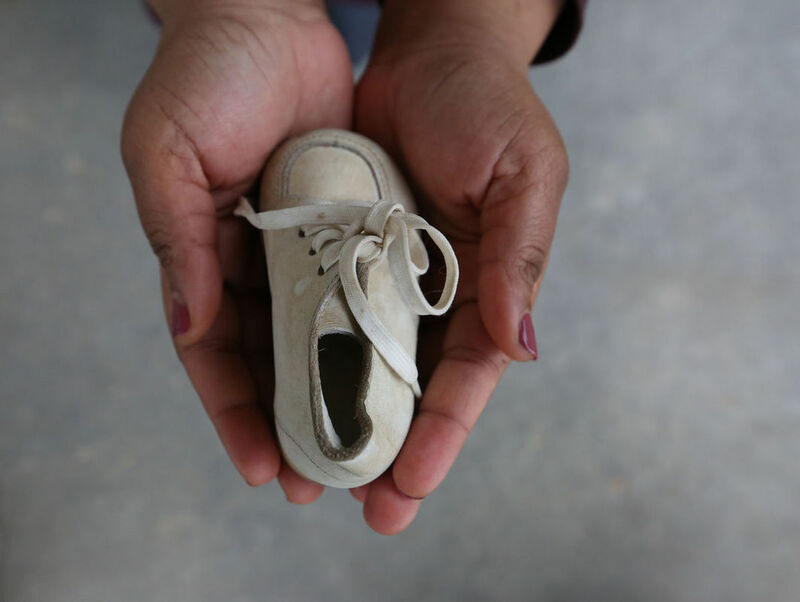 St. Mary’s also works to help put in place a continuum of support for the mothers once they leave the hospital. Photo and logo from Cap Times article. ​"If you lose a grandparent, parent or good friend, you lose part of your past, she said. If you lose a child, you have lost the future." We are excited to reach out to our state representatives to support this bill. We moved information about the progress of this bill to a new page. Please visit the Legislation page for up to date information! 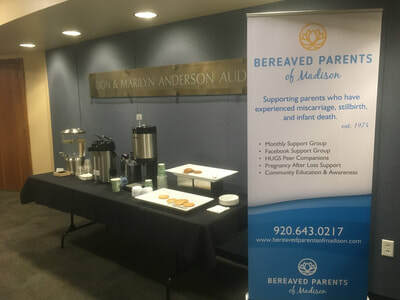 ﻿Bereaved Parents of Madison, Inc is proud to be collaborating with Sarah Rickerd from Carry Your Heart Jewelry and Gifts, and Christine Mickelson from Cress Funeral Homes in Madison to identify best practices for funeral directors when serving a family who has experienced a pregnancy or infant loss. We know that improvements can always be made and by collecting responses on this brief survey, we can identify those. 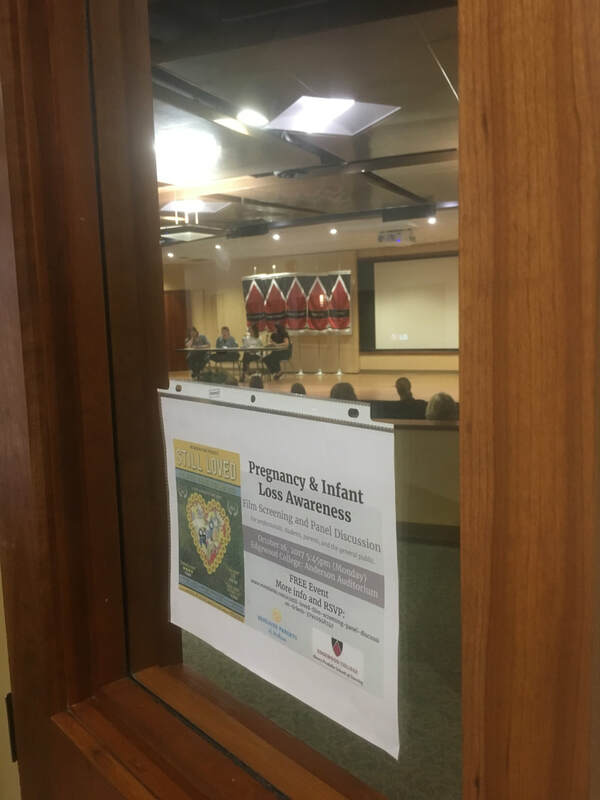 The result of the survey will be shared in the form of a presentation of Best Practices for Caring for Pregnancy and Infant Loss Bereaved Families at the National Funeral Directors Association Conference in October of this year. --Experienced miscarriage, stillbirth, or infant loss. --Loss must have occurred within the past 10 years. --Used the services of a funeral home for the loss. We would love your support for gathering responses…our goal is to have 500! Please take the 25 questions survey if you meet the requirements and share the link with others who may also qualify. Thank you in advance for your time and sharing so we can help make positive changes to bereavement care on a national level. 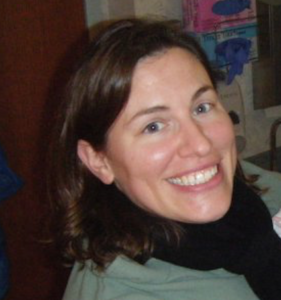 Rebecca shares her experience with pregnancy after the loss of their first born daughter Lily. During the immediate aftermath of my loss, I felt so alone – despite the outpouring of support from my family and friends. It felt like I was the only one who ever experienced such a devastating loss. At these support group meetings, I felt comforted because I wasn’t alone. It was a relief to be able to relate to other parents and have them understand why I felt a particular way. They understood why my baby’s due date was hard or why the anniversary of her birth/death date hurt year after year. No matter how far you’ve come in your grief journey, a moment, a thought or smell can send you back into a very raw pain. These parents knew how hard it can be to see a loved one’s pregnancy announcement and how years later knowing someone who’s had a baby girl born in May will always sting a little. 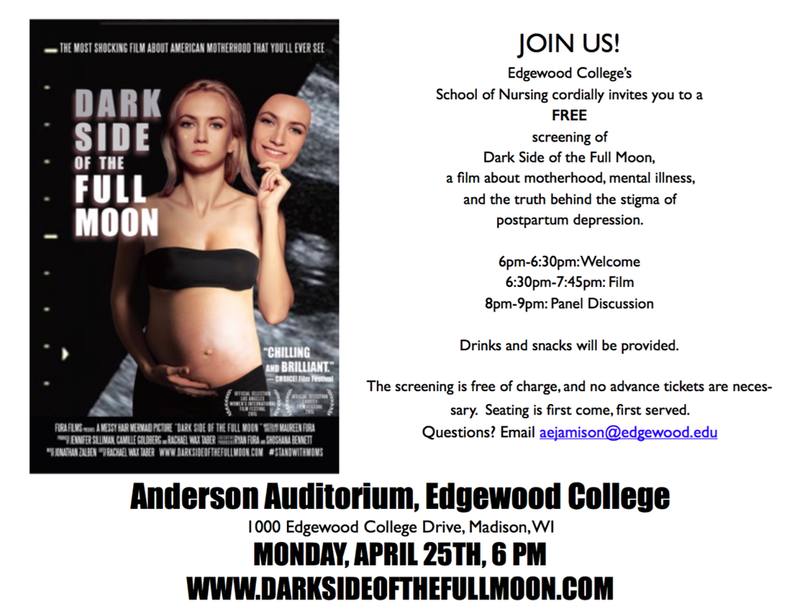 in April 2016, Bereaved Parents of Madison, Inc was invited by Ann Jamison MFT, to participate in a panel discussion following the screening of Dark Side of the Full Moon at Edgewood College. The film focused on maternal mental health and postpartum depression. Pregnancy and infant loss was not included in the film, so our panelist Tina Keller shared her experience. 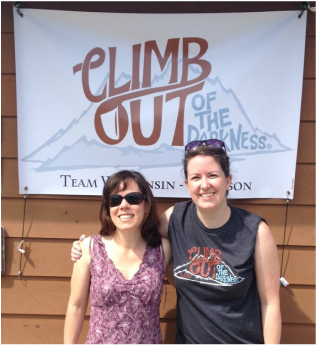 Bereaved Parents of Madison, Inc. was invited to the resource table at the local Climb Out of the Darkness walk on June 18, 2016 hosted by our local Warrior Mom Kat from Postpartum Progress. They focus on maternal mental health surrounding childbirth. 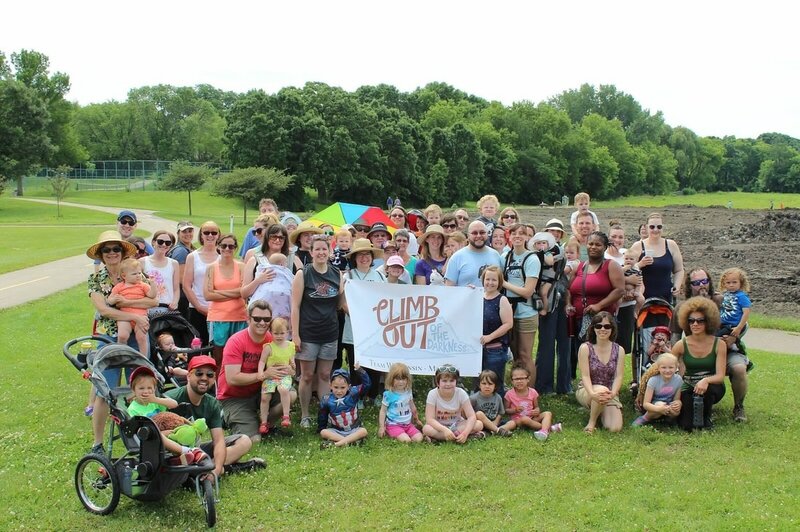 "Lots of young families turned out to Climb Out of The Darkness. Great awareness event for maternal mental health. 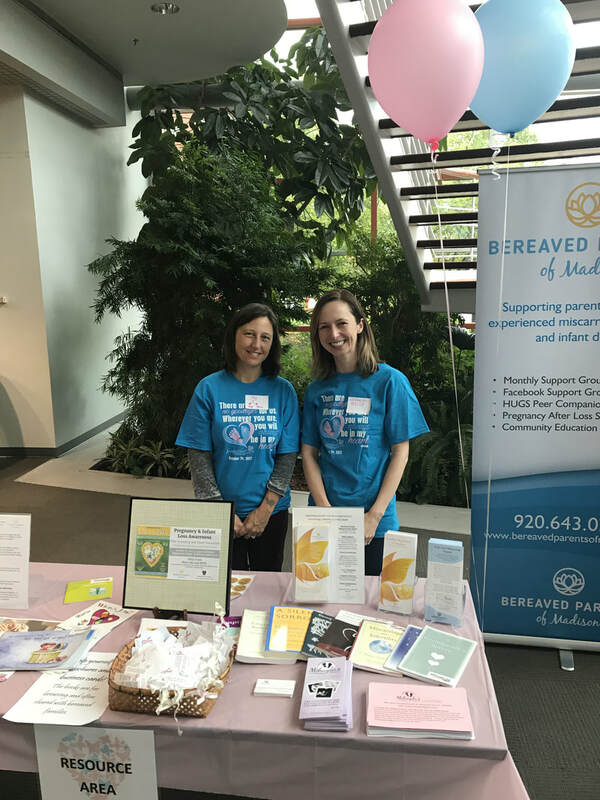 Several folks stopped by to learn about BPoM, take information for friends, and tell me about the great work they're doing to keep all of our mamas healthy and supported." 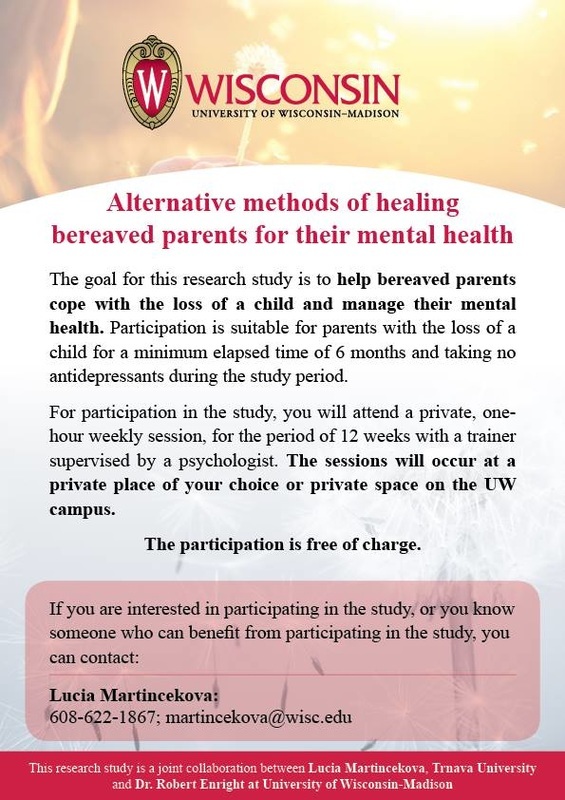 We were approached by a grad student at UW-Madison who is completing a study with the goal to help parents cope with the loss of a child and manage their mental health. Bereaved Parents of Madison, Inc. is not affiliated with this research study, so any questions can be directed to the name and number on the flyer. Contact them if you are interested or with any questions. If you are making a donation in memory of someone special, please let us know!